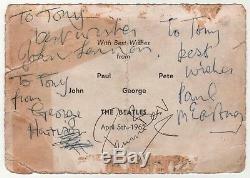 Mega-rare set of Beatles autographs, signed on a promotional publicity photograph dated April 5th 1962. The photograph has been signed "To Tony" by John Lennon, Paul McCartney and George Harrison in blue ink. The autograph of Pete Best was signed later in black ink. The promo photo is in Fair C ondition with some age-wear, creasing and tape stains (see scans). A very rare and collectable piece of original 1962 Beatles memorabilia. 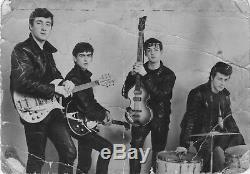 The item "Beatles signed autograph John Lennon Paul McCartney George Harrison Pete Best" is in sale since Monday, March 18, 2019. This item is in the category "Music\Music Memorabilia\Artists/ Groups\The Beatles". The seller is "horizontalman" and is located in London. This item can be shipped worldwide.